Path of Exile makes me smile. It isn't because of the gritty, dark setting or how a swing of my mace scatters disembodied monster pieces in every direction. It isn't the interesting design of the passive skill tree or the inclusion of PvP. What makes me smile is knowing that the kid inside me has finally found a worthy successor to the action RPG Diablo II. Oh, and it's free-to-play. 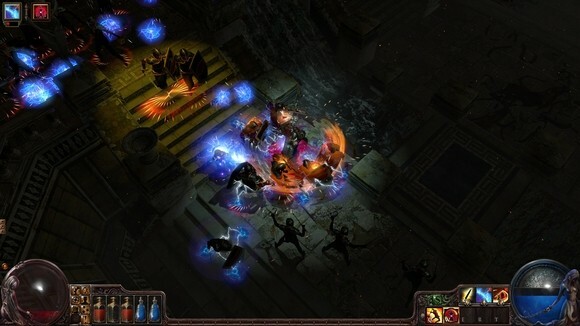 Grinding Gear Games begins the PoE open beta on January 23rd, 2013. This week I massacred hordes of various dark abominations with Lead Programmer Jonathan Rogers and Producer Chris Wilson in the brand-new Act III content. And after my demo was finished, I almost felt bad for Diablo III. My path began as the Marauder, a beefy man-mountain who specializes in strength-based mayhem. Hurrah! Wilson decided I needed a refresher course on skills, showing me how gems placed in weapons are used to gain new abilities. Several pieces of armor I was wearing contained linked gem sockets that allowed me to create upgraded and new abilities with secondary gems. "This totem spell that attracts enemies, for example, can also be equipped with a teleport support gem in the linked gem slot. 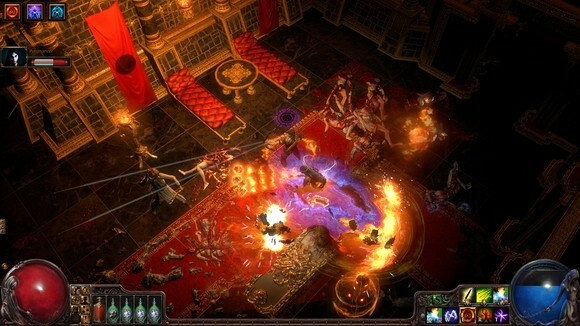 Now the totem skill will warp around damaging enemies," said Wilson. "We didn't plan this combination, but it really works. The players are coming up with lots of combinations on their own." I managed to meld my cleave attack with a life-stealing secondary gem. My weapon visibly began to pull health from enemies each time I used the attack. This flexibility pours over into the passive skill tree, too. Opening up the skill tree is almost intimidating. There are hundreds of perks and countless paths to choose from; unique and powerful skills on the edges of the tree come at a price. Resolute Technique, for example, removes the enemy's ability to evade your attacks but at the price of never gaining a critical hit again. Another example is Blood Magic, which removes the mana cost of skills and replaces it with a blood cost, a devastating skill for traditional Witches. "Still, we've seen Witches build blood mages by creating specs that cross over into the health perks of the Marauder section of the tree," said Wilson. My Marauder wasn't a fan of change and opted for anything that benefited feeding a two-handed mace with my new life-stealing cleave. The incredible detail and lighting struck me the moment I entered the abandoned docks of Sarn. Skeleton mages were casting bright blue bolts of magic, lighting the atmosphere as they homed in on my character. "This is one of my favorite areas of Act III," Rogers told me. "The big piles of steel, the groups of enemies, and the industrial vibe almost create a steampunk feel to the environment." He was right. Each and every zone has numerous details that add incredible depth and immersion to the game. In a later zone, barricades were made from discarded corpses, each with an eerie level of detail right down to the skin sagging over broken rib cages and heaps of what looked like organs. The lighting shines in caves and underground lairs; my Marauder's light cast shadows that shrink and grow with each click of the mouse. I really felt trapped by the darkness and the sounds of skittering, unseen creatures. Rogers explained that open beta will add 50% more content to the game; in fact, the developers are planning on more for the official release (the rumored "Act IIIx"). He wouldn't tell me much about Act IIIx, but I found the entrance myself: a locked door with carvings of a Cthulhu-like beast. Rogers just smiled. I continued to pop enemy heads with the joy of a five-year-old discovering bubble wrap, while Rogers talked cash-shop specifics: "We're offering all content for free," he said. "We want players to enjoy the game, not feel as if they have to purchase stuff in order to have fun." He told me that all of the playable content through ACT IIIx is planned to be free of charge. "We want our cash shop to reflect what we like in F2P games. No buying powerful weapons or content packs. Definitely no XP potions. It would ruin the point of our progression races." The game will be supported by players buying cosmetics or glowing effects for armors and weapons, along with minipets -- an incredibly generous ambition in this era of nickel-and-diming. PoE is a great package. It's a F2P action RPG that holds up well to its competitors, and in many cases, pushes beyond my expectations. Since PoE is preparing to launch into open beta, Rogers reminded me that the upcoming character wipe will be the last ever. "Once we go open beta, characters will remain in the game even after launch. It's a great time to start."